Unassisted Childbirth (UC) refers to when a woman chooses to give birth at home or elsewhere without the assistance of a healthcare professional. UC is also commonly called free birth. It does not refer to giving birth at home before the planned arrival of a healthcare professional, perhaps because of a precipitous or fast birth, commonly known as a BBA (Born Before Arrival). Statistics for planned UCs or births unintentionally occurring without a healthcare professional are not currently available in the UK, as they have not been collected by the NHS. Those who promote UC state the practice offers mothers-to-be a natural way of welcoming their child into the world, with no outside influences. The women who are choosing UC may do so because they do not feel supported and respected in the obstetrical or midwifery care options available to them locally, or simply because they have complete confidence in their ability to birth and do not feel the need to have any attendants there. While supporting a woman’s right to autonomy over place of birth, medical and midwifery organisations generally consider UC to be a risky practice for both mother and baby. However, UC is a perfectly legal and legitimate informed choice for a woman to make in the UK. Women are not obliged to accept any medical or midwifery care or treatment during childbirth and cannot be compelled to accept care unless they lack mental capacity. Being present at a planned UC is also not illegal. However, in the UK, Article 45 of the Nursing and Midwifery Order makes it a criminal offence for anyone other than a registered midwife or doctor to ‘attend’ a woman during childbirth, except in an emergency. This is not intended to prevent birth partners from supporting women, but they must ensure that they do not assume the role of a midwife by performing midwifery functions, such as monitoring the progress of labour. The Nursing and Midwifery Council has produced guidance on this issue which states that birth partners, including doulas and family members, ‘may be present during childbirth but must not assume responsibility, assist or assume the role of the medical practitioner or registered midwife or give midwifery or medical care in childbirth’. Doula UK (DUK) does not take a stand or position on UC. However, DUK registered doulas are strongly encouraged to address the multifaceted considerations of attending a planned UC. Will I be expected to perform any tasks contrary to the DUK Code of Conduct, such as monitoring the progress of labour, checking heart rates, etc? Do I understand the legalities surrounding UC, including a midwife’s responsibility under their NMC Code? Could I be perceived to have taken the role of a midwife at the birth (i.e. contravened Article 45 of the Nursing and Midwifery Order) perhaps by a medical care provider, a social worker, a member of the family, or a law enforcement officer? In the event of a bad outcome, could someone – the immediate family, their extended family, or a medical care provider – consider that I may have been responsible? This may be the case even if you weren’t perceived to have taken the role of a midwife, perhaps because you were perceived as having ‘persuaded’ the mother to choose UC? Am I prepared to deal with any potential consequences of such a claim, whether or not warranted? Do I have, or want, the ability to pay for, or claim for, legal assistance with such a claim? 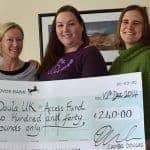 Whilst Doula UK is able to give emotional support to members, it is unable to provide legal protection. In the event of an emergency situation, or a bad outcome, occurring, would I regret my decision to be present at a planned UC? RCOG statement on unassisted childbirth or ‘freebirth’. Royal College of Obstetricians and Gynaecologists(RCOG). 2007. Unassisted Birth: The Legal Position. BirthRights. Doula UK Code of Conduct. Doula UK.